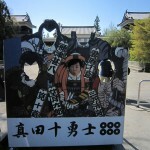 In the Shinto Religion, “Hachiman” is the god of war, life and culture. Omihachiman means literally Hachiman in Omi and here was prospered as a castle town of Omihachiman castle built by Hidetsugu Toyotomi ,hideyoshi Toyotomi’s nephew. American architect W.M. Vories came to here and spent most of his life in Omi hachiman.? There is a residential area called “Ikeda-cho” in which many of houses were designed by Vories. 25 min walk or 5 min by bus from Omihachiman Sta.